This story was written by Farhan Bokhari for CBSNews.com. Pakistan's security services on Friday placed the country's major cities on high alert after at least two people were killed in a bomb blast near the parking lot of the Marriott Hotel in Pakistan's capital. 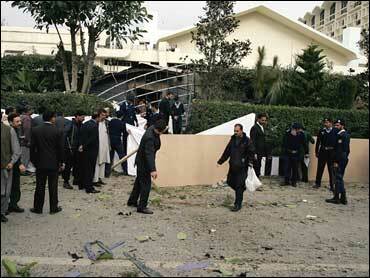 At least five people were injured in the blast in Islamabad. No one immediately claimed responsibility. Senior Pakistani security officials said the blast, which occurred a five minute drive from the prime minister's residence, parliament and Islamabad's diplomatic quarter, was a powerful reminder of the security challenges faced by Pakistan – a frontline state in the U.S. led war on terror. Western diplomats said their embassies had immediately advised them to avoid Islamabad's hotels and other public areas until security conditions become clear. One of the victims was thought to be a suicide bomber who tried entering the Marriott from a side door and blew himself up when security staff from the hotel blocked his entry. The other victim was a hotel security guard killed while trying to block the bomber. One official told CBS News the timing of the blast was significant, coming ahead of Ashura — the 10th day of the Islamic holy month of Muharram — which falls on Monday. Last weekend, Shiite Muslims across the Islamic world began a month of mourning to mark the anniversary of the death of Imam Hussain, the Prophet Muhammad's grandson. Muharram is traditionally commemorated by Shiites, who form a majority of the population in Iran and Iraq but are the minority in Pakistan. In previous years, hardline groups from the majority Ssunni Muslim sects have attacked congregations of Shiites during Muharram. Fears have been running high this year over the possibility of more such attacks, with many militant Sunnis' rage stoked by the controversy surrounding Saddam Hussein's execution. "The sectarian angle in this incident is central to our investigation. That's not because we have tangible evidence yet, but because of the timing" one senior Pakistani security official told CBS News, on the condition that he would not be named. Western diplomats said, however, that it was too early to draw conclusions about a possible sectarian motive in Friday's blast. This caution was due largely to al Qaeda's stated determination to attack targets frequented by western visitors to Pakistan — such as five star hotels. "The Sunni-Shiite angle is obviously important, but lets not forget there's a wider angle. Pakistan continues to be a target for al Qaeda," said another western diplomat, speaking on condition of anonymity.